With the release of Princess Celestia and Princess Luna in late December, Funko and Hot Topic gave fans of the My Little Pony: Friendship is Magic animated series, two of the show’s major secondary characters to add to their collections. With the Mane 6 characters already out in stores, the door seems wide open now for additional secondary and background characters to find their way onto store shelves. Of course, the realm of secondary characters still has plenty to go through on the checklist. He’s been a part of the My Little Pony legacy for many years…but it was largely within the Friendship is Magic series, did Spike gain a little more respect…and a small legion of fans. The baby dragon assigned to be Twilight Sparkle’s assistant has been on some interesting journeys of his own. Spike’s time with the Mane 6 definitely helped him gain a wider perspective on things that were considered “girl’s stuff,” and he also ended up having a crush on Rarity. Some have considered Twilight and Spike’s relationship to be akin to a Mother and Son. To me, I saw them more like an older sister and an adopted brother, with the older sister kindly allowing her brother to join in with her friends and their adventures. 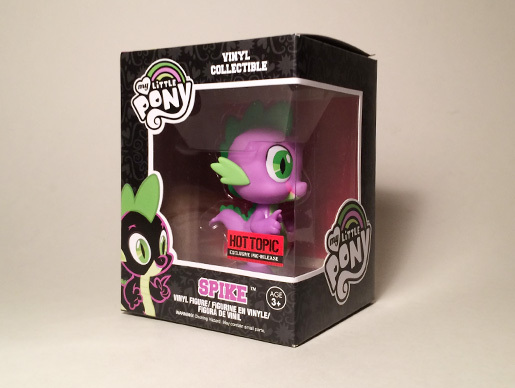 Spike’s figure is the first of a smaller wave of Friendship is Magic figures, that are not in the exaggerated FunkoPOP line-up. Even so, his vinyl material is made from the same type as the POP figures. With animation, Spike’s form is exaggerated at times, but the sculptors at Funko managed to do a decent job translating him into 3 dimensions. They even worked on giving him more of a dynamic pose. Instead of just having his arms to his sides, we get his right arm with a raised claw, as if he’s ready to make a suggestion. The sculpt does shave down the size of his head’s scale ridge, and his eyes seem a little big when seen from the front. An impressive little detail, is the faintly-painted eyebrows over his eyes. They could have done away with this, but I think the light paint application works well! Size-wise, Spike is pretty close to his scale on the Friendship is Magic cartoon series, and puts him at chin-level with the main ponies in the Funko lineup. Even with some minor issues here and there, I think he’s a great little purchase to add to many collections, and for many fans of the under-used “number one assistant,” is a great new figure. As any series continues chugging along, numerous characters are introduced that were not part of the original story pitch. With the 2-part Season 2 finale, A Canterlot Wedding, many were introduced to Twilight Sparkle’s brother: Shining Armor. But he wasn’t just any sibling: he was Captain of the Royal Guard in Canterlot! (Twilight and Shining’s parents must be very proud of their two famous children). Considered Twilight’s BBBFF (Big Brother Best Friend Forever), Shining’s role on the show has largely been of a supporting character. After the reappearance of the Crystal Empire at the start of Season 3, he and Princess Cadance were assigned to protect and rule over the Kingdom, starting with the beginning of Season 3 of Friendship is Magic. Much of the world press went crazy over the wedding of England’s Prince William to Kate Middleton in April of 2011, and in April of 2012, the royal wedding story seemed to make little references to England’s real-world union. Much like Prince William, Shining Armor is befitted in a jacket that seems very similar, along with a blue sash. This also makes Shining Armor the first male stallion to be (almost) fully-clothed. The jacket also helps hide the seam between his head and body, making for a nice, clean assembly. Shining also is a first in two areas regarding stallions produced by Funko for this line. Not only is he the first male unicorn, but he is the first medium-sized one, between the smaller Dr Hooves, and the larger Big McIntosh figure. The one area of Shining Armor’s design that is a little wonky, are his eyes. By the looks of it, he was meant to be viewed from a 3/4 angle, giving a “too cool for mule” smirk. The eyes don’t work so well in a front view, which makes him go wall-eyed. Also of note, is that when seen from the front, his unicorn horn is placed slightly to the left. As it stands now, Shining Armor’s figure is one of the better crafted ones, with the exception of being viewed from head-on. Given that he only wore his royal jacket just one time, I do wonder why they didn’t just release him as a non-clothed stallion, given his many other appearances sans jacket. Probably of all the characters introduced in Season 2, Twilight Sparkle’s former foal-sitter and new sister-in-law, racked up quite a lot of fan-based eye-rolling when she was revealed to be another alicorn…though not quite on the same levels of power as Celestia, or Luna. While Celestia and Luna seemed to buck the trend of being “pink pony princesses,” Cadance seemed to fit that role to a “T.” A sweet-voiced alicorn whose power seemed to be centered around love, she didn’t seem as deep or serious enough to please those who took the show’s world super-seriously. Much of her appearances have simply been relegated to being in bad situations, which leads me to feel that she’s almost the equivalent of an assistant. I mean, Celestia pretty much gave her and Shining Armor total control over the Crystal Empire, and put them in extremely-stressful situations in protecting the place from the evil King Sombra. In regards to her Funko sculpt, Cadance did surprise me in several ways. My first thought was they had simply re-used Princess Luna’s mold, but much like some other pony sculpts, she’s a brand-new one! For example, Cadance’s wings are slightly smaller than Luna’s, and her neck seems thicker than Luna’s as well. They also added a slight airbrushing of purple to her wings, much like Cadance’s wings on the show. Even her head isn’t looking straight-ahead, but is tilted down and to the left slightly. Cadance also has a pretty large shock of hair, though looking a little more like taffy than cotton candy, given the texture of the vinyl being used. Like most first-releases, Cadance is not without some sloppiness, but she seems a little more sloppy in paint areas than Spike or Shining Armor. A positive is that the vinyl “seams” in parts of her face are not as noticeable as those on my Princess Luna figure. Even with these issues, I still find her release to be very well done. The figures should now be available at your nearest Hot Topic stores, or on their main website. Shining Armor and Princess Cadance each retail for $18.50 apiece. In the case of Spike, his smaller size puts him at a cheaper price, of $12.50. As of this writing, these three figures will also escape the exclusivity of Hot Topic in late September, when they become available through several other retail outlets. I had thought that along with Shining Armor and Cadance, we’d get our first villain figure since Discord, in the form of Queen Chrysalis (who also appeared in A Canterlot Wedding). However, her absence does bring up a thought that has been on my mind since these figures were announced: is it possible that Funko might not give us the villains in the series, at this size? Sure we have Discord, but he’s in that grey area due to his reformation episodes. Recently, pictures surfaced showing Chrysalis being a figure in the smaller, Mystery Mini’s series of Funko figures for the show, but it does make one wonder if she’ll have a larger counterpart or not. As it stands now, the main secondary characters regarding royalty have all been released, which leads to my speculation that Funko will try to produce some of the more normal secondary characters we’ve seen the Mane 6 encounter, such as Zecora, or Ms Cheerilee. The upcoming Fall release of their Mystery Mini lineup also includes figure of Season 4’s characters of Cheese Sandwich and Maud Pie, which leads some of us to believe they’ll be joining their larger counterparts soon. As one can see by the paragraphs above, there’s plenty of room for speculation in keeping the series going. With Friendship is Magic almost halfway through its 5th season, there’s bound to still be some momentum and demand for more characters. Of course, the big question will be how long the line can last, since almost all of the more important members of the cast have all been released. In the Summer of 2005, there was much teeth-gnashing by many moviegoers. It wasn’t enough that George Lucas had made Darth Vader whine in agony with James Earl Jones’ voice, but to many, Warner Brothers and Tim Burton were committing a major crime against childhood, by (re)making Charlie and the Chocolate Factory. The majority of those who were upset, claimed the studio was remaking the 1971 film (titled Willy Wonka and the Chocolate Factory), which was based off of author Roald Dahl’s most famous book. Even with Burton and Johnny Depp telling theater goers that their take was closer to Dahl’s writing, many just claimed Depp wasn’t as awesome as Gene Wilder’s take on the Wonka character. Aside from giving Willy Wonka “daddy issues” and making him a pale-skinned eccentric, there wasn’t really that much I could see to complain about. Then again, I’m sure many would express the same ire if word came that The Wizard of Oz or The Neverending Story were going to be more “faithfully adapted.” Plus, I never really held the 1971 film in as high of a regard as some people (live-action musicals were not a staple of my childhood viewing ‘diet’). Unlike the 1971 adaptation, Charlie’s distributor Warner Brothers knew there was money to be made from merchandising. Familiar companies like NECA Toys, and MediCom(known moreso for its collectibles in Japan), were soon touting their wares. But in a press release from Warner in January of 2005, it was announced that a lesser-known company would be joining in on the mix(ture). That company was called Funrise Toys (oh, clean up that dirty mind right now!). Though NECA and MediCom would craft more specialty items like Wonka Bar style throw-pillows and collectible vinyl dolls, Funrise’s products focused on the film’s younger demographic. The results were puzzles, games, and…action figures. Several of the products Funrise Toys produced in conjunction with the film. The other two companies would also make figures, though they would moreso focus on those of Willy Wonka, and several of the Oompa Loompas. Funrise‘s figure releases were more notable, as their assortment would contain the only figural representations of the films’s 5 lucky golden ticket winners. Each figure came in a blister pack, along with a green base, and a sculpted candy plant, based on the same designs of those seen in the film’s Chocolate Room. The green base that comes with each figure is identical, with a peghole for each of the specific plants, as well as a peg for the figures to use for standing. The only difference among the bases, is the one for the Oompa Loompas, that has an added peg for the additional Loompa to use. One would assume that with a major summer film like Charlie, the figures would have been popping up at every single toy/retail store. Instead, it seemed very few of the retailers bit at Funrise’s offerings. When the series of figures was released that summer, it was (scheduled) to be released in two waves (to the best of my knowledge). I recall seeing figures of Wonka, Charlie, and Augustus at a Spencer’s Gift shop, as well as a few Wonka’s at a Toys R Us. However, I never saw any of these figures hit the big-box retailers like Walmart, or Target. As for the release of the additional figures (aka ‘the second wave’), I couldn’t find any information on how Violet, Veruca, Mike, and the Oompas escaped into consumer’s hands. The only place I ever saw the additional figures show up, was on eBay, and most of them were being sold from overseas. While many of the auctions for the film’s figures were made up mostly of the first-wave figures like I had seen at Spencer’s, if you were patient, every-so-often the others might show up. Of course, they wouldn’t come cheap (I recall an unopened Violet figure going for around $70 on one auction I watched, a few years after the film came out). Examples of abrasions and adhesive problems on several of the figure’s packages. While looking online, I was able to find some early prototype images on one site. What was most notable were the figures of Veruca, Mike, and Willy. Veruca’s prototype image shows a different type of candy tree, and unlike her pink purse being a removable object, it is actually underneath her fur coat (which is how she wears it in the film as well). Mike not only has a different candy tree as well, but his prototype shows the ‘flaming skull’ image that the character has on his t-shirt in the film. For reasons unknown, this design was not included on the final figure release, even though the assortment image on the back of each figure’s card shows the proper shirt design. Speaking of the back of the figure’s cards, one interesting difference can be seen regarding Willy Wonka. The figure image on the back shows Willy with an open-mouthed smile, whereas the final sculpt differs greatly. It may be just me, but it almost looks like they did a last-minute head re-sculpt. My guess is they were trying to make Wonka look more enigmatic, but the end result looks like either his head’s too big, or his top hat shrank in the wash. Along with the single-carded figures, Funrise also released a Wonka Figure Assortment consisting of Willy, Charlie, and the two Oompas, but without their candy room bases and plants. After 2005, it seems Funrise did not consider another attempt at being the main action figure producer for a feature film. According to their current website, they are currently producing additional plush and toy offerings, for successful brands such as My Little Pony, Pound Puppies, and they also appear to be the official license holders of a toyline I recall from my youth:Tonka Trucks. Originally, I was going to end this Raiders article here, but a little voice in my head reminded me of something. In looking for information on these figures online, I think I am the first person to ever do an article on these ‘lost toys,’ and as such, I could very well run several in-depth reviews on each of these figures. There are only a few other reviews of this figure series online, and they only covered the Willy Wonka figure. There’s not a whole lot to these toys, but I think there’s plenty to analyze and review, and besides, I’ll be adding a little more information to the World Wide Web. Be on the lookout for my 3-part review of the Charlie and the Chocolate Factory action figures, in the not-too-distant future. Since its introduction a few years ago, Hot Wheels’ Retro Entertainment Series has turned itself into a one-stop shop for 1:64 scale diecast vehicles, associated with some of history’s most famous film and television vehicles. We’ve gotten all sorts of vehicles, including those from Knight Rider, Ghostbusters, Magnum P.I., The A-Team, Smokey and the Bandit, and many more. When the line was originally announced, there was one film series eagerly on my mind: Back to the Future. Let’s face it: along with fascinating many of us with tales of disrupting the Space-Time Continuum, there were also plenty of modern-day, future, and vintage vehicles on display in the films. Over the last few years, the line-up has included the following vehicles, that all appeared in the 1985 film that started it all. Like many teenagers, Marty McFly dreamed of having a sweet ride of his own. Of course, even I as a 6-year-old watching the film, could see the allure of the Toyota 4×4 being driven around Hill Valley’s Courthouse Square. If there was one thing my young mind liked besides flashy sports cars, it was big trucks (it was the era of Monster Trucks and Bigfoot, after all). Though the truck was not a prominent player in the film, it definitely became part of the vehicle “lore” of the film. Two differentToyota Hilux model trucks were used over the course of the trilogy. The one Marty sees in the first film, is significantly different than the one we see in Parts 2 & 3. By the looks of the toy, Mattel tried to hit a happy medium. At first, I thought this was a brand-new molding, but is actually based on a previously-done one not associated with the film. Design-wise, the molding doesn’t include the front grill/bumper-guard like the vehicle seen on the film. They also made the tires over-sized on the vehicle. As you can see from the main picture, they’re only slightly larger than average vehicle tires. The design also deviates from the real vehicle in the film, in that the truck is missing a front grill bar, and the toy does not include the extended cab window behind the driver and passenger doors. For the die-hard Back to the Future fans, the license plate shows the markings from the first film. In the sequels, the plate information was changed. Obtaining this vehicle was a pretty difficult feat in itself, as I never once saw it at a local store, and secondary market prices have pushed it to starting bids above $15. Luckily, i found one for sale in damaged packaging, which suited me just fine, as I intended to display it. To many, Back to the Future was our first introduction to the DeLorean DMC-12…though with some added accoutrements to send Doc Brown’s creation through the space-time continuum. The mold for this vehicle has been used in some of the regular main-line iterations of the DeLorean time Machine, but this one sports some additional paint details, and a less shiny metal body. The paint applications on this vehicle are minimal, mainly relying on colors of black, light blue, and yellow. It is also nice to see the rear exhaust ports given a metal sheen (some iterations have often confused their coloration to just be flat-black). Throughout almost all iterations of the DeLorean, they often give the vehicle the same-sized wheels, rather than than larger rear tires, and smaller front ones. Given the different-sized wheels on some releases, it’s sad they didn’t go this direction with the Time Machine. It’s been several release waves since this vehicle has come out, and it has entered into some high secondary market prices, along with other Retro Entertainment vehicles like Ecto-1, and The (1966) Batmobile. In 1955 Hill Valley, CA, Biff Tannen and his gang could often be found tooling around town in Biff’s shiny black ride. Of course, Marty McFly ended up making the dimwitted bully a laughing stock, when he ended several of his chases, by rear-ending a manure truck. This release is the only official release of Biff’s Ford, and also includes the same plate numbers, and red interior as the one on-screen. Much like the Toyota Hilux, Mattel chose to mess around with the vehicle’s wheels, giving it larger rear wheels. Biff’s car was one that many of us definitely didn’t expect to ever be made…but made it they did, with the most amazing accessory that noone asked for: a plastic pile of manure that one could remove from the vehicle! The mold is not new, but a re-use of one created for the Ford vehicle, from the film, The Karate Kid. It also may have been used as the Ford vehicle from the Grease. Given the moldings being similar, the plastic manure pile could also be “dumped” into these vehicles as well. Overall, Mattel’s Back to the Future offerings are good, but they didn’t put me over-the-moon like some of their other releases, like those for Ferris Bueller’s Day Off, and Knight Rider. The downside of obtaining these vehicles, is that the majority of major store chains don’t seem to carry them. A few Toys R Us stores did during the first few waves, but since then, they seem to have given up. In cases like this, I’ve had to turn to the internet to find what I wanted. The most recent release has included Biff’s Ford convertible, but it may be too soon to tell if its secondary market value will increase like the DeLorean and Toyota 4×4. Currently, there is word that by the end of 2015, Hot Wheels will release two more iterations of the DeLorean Time Machine: one in hover-mode, and the other with the white-wall tires when Marty went back to 1885. Even so, I feel there’s room for a lesser-thought-of vehicle (I mean, they added a Pontiac Fiero glimpsed briefly in Ferris Bueller’s Day Off!). And that car that I’d love to see is: Doc Brown’s yellow Packard. Not a very prominent vehicle, but it was in each film of the trilogy, and it’s a vehicle that I don’t think has ever been done in 1:64-scale diecast. Since its release in November of 2014, Big Hero 6 has continued Walt Disney Feature Animation’s climb back into theatrical prominence, and mainstream consciousness. It also embellished on the Marvel Comics title of the same name, re-imagining its characters, into a team of nerds-turned-superheroes. Though there was one of its members who was not actually human, and that would be Baymax. His appearance brought forth another round of sidekick-love from Disney fans, with numerous plush of his non-armored self selling out in stores. His absence on store shelves mimicked such sidekick popularity as we saw with the likes of Olaf, and Vanellope Von Schweetz. Though the majority of Baymax’s toys were of him in his shiny red supersuit, I and many others were more interested in his earlier incarnations. In recent months, Bandai Toys quietly expanded on their action figure line that came out in the fall, adding two more versions of Baymax. And with that simple phrase, we were introduced to Tadashi Hamada’s personal project: a soft-bodied nurse-robot. Baymax has been a part of much of the film’s advertising campaign, with even his soft plush figures selling out of the Disney Stores over the Holidays. I must say that Bandai Toys has done a pretty good job of rendering Baymax in action figure form. From his chest-drive plate, to the darker-colored points of his elbow and ankle areas, and even the way his forearms are a little thicker in size. While I would have loved him to have elbow-joints, I can understand the toymakers wanting to make sure his arms kept their basic shape in his standard pose. A minor design nitpick for me, is Baymax’s head. It looks a little ‘deflated,’ compared to the many images we’ve seen since the film first came out, or it could also be that the ‘face’ portion of his head, is a little larger than in the film. As well, given his body shape, he can’t be posed beyond simply standing straight. So, if you hoped to have him cuddling Mochi like in the previews, you’re out of luck. Speaking of Mochi, Hiro’s cat also comes with this iteration of Baymax. Mochi himself is depicted as a normal cat, with some small rocket-powered boots on his paws. This may seem weird to those who saw the film, but in the original opening, this is explained (and which can be seen on the home video release of Big Hero 6, in the deleted scenes section). A storyboard from the unused opening for “Big Hero 6,” showing Tadashi and Hiro working on a project, with Mochi. On the deleted scenes included with the recent home video release, one segment showed how a younger Tadashi and Hiro had conceived of these rocket boots…sending poor Mochi rocketing out of the house and down the street! It is a cute and fun little addition to Baymax, and a fun easter egg for those of us who recognize it. However, the filmmakers didn’t completely abandon the rocket boots, as one inventor at San Fransokyo’s Institute of Technology was testing a similar invention on another cat. It is nice to see this iteration of Baymax. However, it does straddle that fine line between being a poseable figure, but also staying true to the original design. As well, it does make it a little difficult to pose Baymax. I feel it would have also been good to have given him a ball-jointed neck, to give a little more articulation to Baymax’s head, since it was one of the most expressive points of his body in the film. Mochi is a nice little accessory, though I do wish he could have maybe had the rocket boots as removable rubber pieces (though that means they probably would have gotten lost pretty easily). After finding out that some masked entity had begun producing microbots similar to the ones he made, Hiro decided to figure out what was going on. Much like how he’d prepare his botfight robots for the unknown, Hiro suited up Baymax using 3-D printed, carbon-fiber components. This iteration of Baymax (which I dub “1.0,” since his red armor is considered “2.0”), is the only toy/figure I’ve seen of this particular version. The sculpt definitely captures several great details on the figure. His “shin guard” portions are actually raised, and the ribbing and rivets on his central body portion are well-done. As well, there’s a back-hatch indent that they didn’t need to add, but did anyways! A downside to this figure, is that unlike the wider ‘feet’ on the “nurse” Baymax, this one has small feet, limiting how he can be posed (aka, “only one way”). i was hoping he’d have pegholes in his feet so I could pose him with an action figure stand I have. Strangely enough, the main line of Big Hero 6 figures did have pegholes in their feet. As to why this and even the non-suited Baymax do not, remains a mystery. Much like my comments on the other Baymax figure, this one I feel could have also benefitted from a ball-jointed neck as well. Unlike the nicely-hidden elbow joints on Hiro Hamada’s figure, Baymax’s arms have a very prominent elbow hinge. Also a low point, is that I was hoping for wrist-rotation…but, I can settle for an angled fist-bump. The good regarding this figure, is it’s nice to get all iterations of Baymax through the film, but the downside, is that the figure doesn’t live up to my expectations. Limited posing, and the inability to have him do much but stand on two feet work against it. I had hoped that with pegholes, I could use one of the pegdiscs from my Star Wars figures, and pose him in one of the action poses he was doing when Hiro tested out his new programming moves. Aside from some online internet auctions, I’ve only seen both of these figures at a local Target store, with each one retailing for $8.99 each. However, if you are looking for these guys, the unfortunate method may be the wonderful world of the internet (with a few dollars extra mark-up). So far, Baymax (with Mochi) and Baymax (1.0) are the only other action figure iterations beyond what originally came out from Bandai Toys in the fall. There’s been no further word about more figures for the toyline, or even of ‘nerd’ figures of each of the film’s human counterparts. That was where I was hoping the line could go, given that I think it’d be great to have a set of both normal, and superhuman figures to display. Disney has the unfortunate habit of only continuing merchandising if the film seems to hit impossible heights of popularity (which explains why Frozen has had almost everything in it merchandised). The boys market for toys seems to be currently relegated to Marvel and Star Wars products, with a hint of the Cars and Planes product still being released. As for merchandise for the more boy-oriented marketplace, films like Wreck-It-Ralph and Big Hero 6 have not seen the bulk of their merchandise piles grow beyond just their Fall openings. Recently, Big Hero 6’s worldwide grosses actually turned out better than expected, making it the most profitable animated feature of 2014. Of course, whether or not this could lead to more merchandise, we’ll just have to wait and see. 1) Rarity’s figure concluded production of the “Mane 6” figures from the show. I had noted at the end of my review of those two figures, that it now seemed an open field to finally see some of the other major supporting players in the world of Equestria, and that’s what Funko gave us. As 2014 wound down, they released two figures of Equestria’s most powerful Princesses: Princess Celestia, and Princess Luna. Some cartoons have a major figure who is a mentor, or a god-like presence, and Princess Celestia fits that mold. The all-powerful ruler of Equestria for untold centuries, Celestia towers over almost all her subjects, commanding the utmost attention, as her ever-flowing mane of colored hair continues to waver in the wind. The princess has been given multiple depictions by Hasbro since the Friendship is Magic toyline began…as well as her “Principal” counterpart from Equestria Girls. However, none of the designs really seemed to come close to the Flash-based cartoon stylings that many had become accustomed to on television. I held off on other variations, certain that Funko could eventually deliver the goods, and…they kinda, did? For this review, I’ve included a screencap of the episode, “Keep Calm, and Flutter On,” seen below. This image shows a good representation of Celestia, as well as her height when it comes to the regular ponies of the show. Comparing the screen cap to the images I took of the Funko figure, it’s like they put the princess in a vice, and squeezed her down in size. The length of her legs is definitely smaller, as are the size of her wings. It’s almost like she’s a video game character that is a few levels away from achieving level-up to her final form. As well, the small representation of her on the box, is closer to her actual cartoon appearance, proportion-wise. It feels like the only thing that survived the money-crunch, was the length of the horn on her head. Celestia’s toothpaste-like mane also is different from other pony releases, in that it is a hollow plastic shell. Probably not surprising, as the amount of vinyl to make her hair, would have made her heavier (and more expensive) than what some would hope to pay. As it stands, the bulk of her hair probably would have outdone Fluttershy’s pink mane and tail. The hair is rather ingeniously attached to her head in such a way, that they are pretty well hidden, and just like Big McIntosh, her neck/head attachment is hidden in the necklace where her body joins the neck, giving a nice clean ‘flow’ to the design. Some have made mention that the attaching of the mane to her head, can cause an ‘imbalance’ to the Princess’ pose, and mine also seems to suffer from this symptom. As you can see in the image to the left, the hair slightly raises Celestia off of her feet…but then again, how often does one look at her hooves? Of the two ruling Princesses in the world of Equestria, it is Princess Luna who has most fascinated the Brony fanbase. Luna’s jealousy of her sister eventually pushed her to become Nightmare Moon, leading to her banishment to the moon for 1,ooo years. Luckily, upon her return, Twilight Sparkle and her friends were able to harness the Elements of Harmony, and purge Luna of her dark powers. Since then, her characterization and appearances have been very irregular to a ravenous fanbase who want to know more about the Princess of the Night. Some episodes that have been fan-favorites for her appearances, have been Luna Eclipsed, Sleepless in Ponyville, and For Whom the Sweetie Belle Toils. For the character of Luna, the image of her on the packaging seems a little odd. Instead of a more regal and somewhat statuesque pose, the image Funko has chosen, shows her almost about to break into a playful gallop. Seriously, it’s hard to get my brain to be so accepting. Going over the figure, it’s one of the few I’ve gotten where I can find almost nothing to really criticize. The use of glittery clear vinyl, with a purple-blue overlay in portions, is a great way to make her ethereal mane and tail come to life. As well, her wingspan is also a thing of beauty, and not undersized like the figure of her sister. When it comes to size, Luna’s height is at a mid-level between the normal ponies, and her sister, Celestia. Unfortunately, the version of Luna I got had some abrasive marks on her head and neck (as seen to the right), almost reminding me of some of the issues that plagued a few of my other early pony purchases. As it stood, she was the only one I could find at my local Hot Topic, and so it was either this one, or nothing. When it comes to figures that have been produced, Luna joins some of my other favorite sculpts that include Discord, Applejack, and Big McIntosh. If she’d had some very minor tweaks here and there, I might have pushed her to the highest grade there was. Due to some issues at several ports this December, plans to release both Celestia and Luna around the same time failed to pass. In fact, I didn’t receive my figures until a month after their planned release dates. Luna was said to be released first, but one wouldn’t know it from the Hot Topic stores I visited, where not a single Luna was to be found…but there were several Celestias to be found. Also when it comes to these larger-sized figures, a comparison image is often something that I feel compelled to include. 2014’s release of Discord is still the biggest figure in the vinyl series, height-wise. In truth, Celestia should almost be eye-to-eye with Discord, and not slightly shorter than Big McIntosh (her horn gives her a slight height advantage). Luna’s height level is acceptable, but when put between Twilight Sparkle and Big McIntosh, it does make her look a little puny. These releases of Celestia and Luna showcase the good and the bad of Funko’s line. On one hand, it proves they can still do some wonderful detail. On the other hand, they are still working within a ceiling of size and pricing. This does pose a dilemma when some consider an unmade character that could possibly be made, that is almost as tall as Princess Celestia: and that would be Queen Chrysalis (seen on the right), the villain revealed at the end of Season 2’s “Royal Wedding” episode. It seems a given that we’ll probably get that episode’s characters Shining Armor, Princess Cadance, and Queen Chrysalis…but like Celestia, it does feel we may be in for a letdown, with one of the remaining large-scale figures yet to come (note: as of the time of this writing, there has been no word if Chrysalis is coming. This is largely me fan-speculating). On the other hand, I’m hoping that the medium-t0-normal scale figures that have yet to be made, will still turn out to be the kind that have made me excited in the past. The sky now seems open, regarding several of the show’s supporting characters, and maybe a fan-fave or two. I know after Season 4 of Friendship is Magic, there’s a few one-shot characters that would be eagerly snapped up by the show’s fanbase. Almost 25 years separates the release of the films Who Framed Roger Rabbit and Wreck-It Ralph, but they both seem to have done a great job in capturing the essence of both the worlds of hand-drawn animation, and video games. As well, each one has given us characters that have stuck with us due to some rather amazing moments. And, they each boast villains that are more than what they seem. The two in these films were so memorable, that I soon found myself having to buy their Funko POP figures, and weigh in on these villainous icons that have stuck with two different generations of Disney fanatics. Eventually, it was revealed just why the judge was acting so strangely, when after being flattened by a steam roller, he was revealed to be the unknown toon who had killed Eddie Valiant’s brother Teddy, many years ago. Now red-eyed and demented, the judge intended to dip Roger and Jessica Rabbit, as well as finish off Eddie with an arsenal of toon props hidden in his right hand. Over the years, Judge Doom has definitely fallen into that category of “1980’s nightmare fuel” for many of us who were children in that era. Doom is definitely one of those creations that made me sink deep into my theater seat when I was 8. When it comes to figural representations, Doom has only ever had a few made of him. A company named LJN made several tie-in figures of Doom, one in bendy form, and another in action figure form. Until Funko’s recent release, Doom had never been rendered without his hat and glasses on, and the Funko POP line has done a great job once again in their exaggerated depiction of a rarely-produced character. This rendition of Doom is an amalgamation of different parts of his appearance in the film. The hair atop his head is a translucent vinyl, and the swirling red-and-white vortex of his eyes is a nice touch. I think it’s a good thing Funko didn’t include a mouth, as I think an open-mouthed grin with the Judge’s fake teeth would have made the figure a little more scary. The Judge is realized here in his trademark black suit. One would assume they would have given him the toon buzz saw or anvil for his right hand, but instead, they have it clutching a POP version of the toon shoe he dips in the ACME Gag Factory. And just like in the film, the little guy here doesn’t quite know what is in store for him (they even made him smile!). Doom is part of a 4-figure set from the film, with other characters including Roger Rabbit, Jessica Rabbit, and Smarty Weasel (because they couldn’t call him by his real name: Smart@$$). Sadly, Funko did not make a figure of Eddie Valiant, which I think would have been a great inclusion instead of the Weasel, since Eddie interacted with the other characters in one form or another throughout the film. Doom’s retail price starts at $10.99, and should be showing up at local retailers very soon. Online, he and the other Roger Rabbit assortment have just been released to a number of outlets. 2012 gave us a film that I feel was one of Walt Disney Feature Animation’s strongest releases yet: Wreck-It-Ralph. Not just a film about mashing together all kinds of old-school video game characters, director Jim Reardon instead decided to tell the story of an arcade bad guy who is tired of his “job” that has gone on for 30 years. His quest to try and become the good guy, eventually leads him to the arcade racing world of Sugar Rush, presided over by the uppity King Candy. The unhinged King Candy it soon turned out, was a re-purposed racing contender from another arcade game named Turbo Time. Turbo was constantly attempting to always be the best, but when a new game called Road Blasters was introduced into the arcade, Turbo abandoned his game, and attempted to take over the hot new racing game. This just resulted in his messing up the game’s coding, and leading to both games being pulled, with Turbo supposedly perishing when he didn’t return to his. Noone knows when it happened, but sometime in the 1990’s, Turbo found his way into the new arcade racing game Sugar Rush in Litwak’s Arcade. He then usurped the Candy Kingdom, and took the throne from Princess Vanellope Von Schweetz. Adopting the high-strung persona of King Candy, Turbo was master of his new domain, until Wreck-It-Ralph showed up, and helped Vanellope reclaim her kingdom. Turbo’s appearance is definitely jarring when one sees him rendered in 3-dimensions in the game of Sugar Rush. With his glowing yellow eyes and teeth, as well as light blue skin, he definitely seems to have a menacing persona, and one that does seem a little scary when one sees him. His reveal when I saw it in theaters, definitely made me flash back to the unmasking of Judge Doom. In the fall of 2012, Funko released 4 POP renditions of Wreck-It-Ralph, Vanellope Von Schweetz, Fix-It-Felix, and King Candy. The demand for these figures soon caused them to sell out almost immediately, and Funko reissued them in the fall of 2013…but included a POP rendition of Turbo, the only figure made so far of this character. Turbo’s size is definitely moreso on par with Vanellope, though this means that the bulk of his mass is in the shape of his helmeted head. Funko has also taken to putting a little more detail into his head than most other POP figures. His all-yellow eyes are rimmed slightly with some magenta, and his eyes have a dark outline around them. Of course, they definitely help add an air of eeriness to him. Turbo also is one of the few POP figures that comes with a mouth. This one is full of crooked yellow teeth, all outlined in black as well. His pose is also one of menace. With his outstretched hands, it looks like he’s about to push someone off a cliff (or into oncoming traffic!). I originally thought that the size of his head would mean he’d easily fall over (his head is almost 2-3 times the size of his body! ), but the squat pose they have Turbo in, helps make sure he’ll stay standing even with a minor shove. Of course, like most interesting bad guys these days, Turbo has amassed a small following of fans online. Even so, Disney has not given the fandom of Wreck-It-Ralph much of anything with him on it. This makes Funko’s figure of him a must-have for those wanting something of the psychotic racer. Originally retailing for $10.99, it’s rare to find Turbo in stores these days. Your best bet is to find him from online outlets like Amazon.com. When Funko originally started their POP line-up, I didn’t immediately spark to it, given the exaggerated stylings and limited facial features. However, the POP line has been instrumental in giving us numerous properties that one can display side-by-side. Aside from the LEGO brand getting multiple licensees, POP is one of the other places one can mash up all sorts of superheroes, pop-culture icons, and characters from TV and film. The line’s ability to give us obscure characters like Judge Doom and Turbo, is also one reason why I have made several purchases from them. They have even made POP figures of such obscure characters as Edna Mode, Remy the Rat from Ratatouille, and Carl Fredricksen. One hopes there may be a few more obscure characters to come in the future (I’m sure some Tangled fans would love a figure of Mother Goethel!). Over the last decade, Funko has proven themselves to be a worthy creator of many vinyl-themed items, across numerous pop-cultural properties. While their exaggerated Funko Pop figures gives us exaggerated likenesses of many famous properties, I have grown to love the quality and effort they have put into their vinyl figures based on the My Little Pony: Friendship Is Magic line. Though they have extended the line to miniatures in blind box packaging, they have not forsaken those of us who collect their 5 1/2-inch vinyl figures. Unlike the brushable ponies one would find at Toys R Us from Hasbro, Funko’s figures cater more to older collectors who would rather display their favorite ponies. There have been three new releases as of August 19, 2014, with figures of Rarity, Daring Do, and Discord. Of these three, I am going to be reviewing Rarity and Discord for this posting. Out of all the “Mane 6” cast members, it was Rarity that I took some time to warm up to. Many of her early episodes made her out to be a little too prissy, and even demanding at times. However, once I saw more of her character (and became enthralled by voice actress Tabitha St Germain’s vocals), she became a little more intriguing to me. With her recent release, Rarity completes the main cast of ponies for the show. A pony that stands out with her porcelain white coloration, and curly purple hair, the figure definitely captures the refined look of Ponyville’s resident fashion designer. Using the same stock body that almost all the ponies have, Funko has sculpted a new head with the unicorn horn on it. Some may assume it’s the same as the head for Twilight Sparkle, but that one did not have a complete horn, as the outer portion was attached to the overhanging hair piece on Twilight. Much like Fluttershy, Rarity’s hair curls and curves in so many different directions. One has to figure she was pushed back from release by Funko, as they worked on trying to interpret the two-dimensional vector stylings into three dimensions. In the show, Rarity’s mane gradates in the inner part of her curls, and it has made me curious what someone with good airbrush skills could bring to this part of the figure. Sadly, the hair is what makes my figure suffer in several areas. There are several gouges in the vinyl portions, and some sloppy adhesive marks where the hair meets Rarity’s neck and head. Fluttershy’s hair wasn’t perfect, but I didn’t notice this many abnormalities in the overall product. One area one might also want to look closely at through the packaging window, is her body coloration. There are some light smudges between her eyes on the one I purchased. It’s often something one has to check regarding some figures with all-white tones. For those looking to complete their “Mane 6” collection, Rarity will be a must-buy. But caution to those of you looking to buy her: examine those in-store at Hot Topic before purchase. Maybe in some later releases, the moldings will get a little better. After all, there were some issues with the early releases of ponies like Rainbow Dash, and Derpy Hooves. It’s often amazing how much Star Trek has permeated into the corners of my life. It seems every other person I’ve ever met has been a Trekkie in some form, and yet, it seems I cannot escape it even on television. It was the mention of John DeLancie (or Q, for those Star Trek: The Next Generation fans) in the Season 2 opener of Friendship is Magic that got many hyped up…and his portrayal of a Q-like Draconequus named Discord, soon won him a new legion of fans. Discord’s features certainly fit with his chaotic personality,containing features such as a pony head, a dragon’s tail, and a lion’s paw. His plans in the Season 2 opener to turn the Mane 6 into the opposite of their true selves and make Ponyville “The Chaos Capital of the World,” was definitely an episode that helped cement me as a fan of the show. While many had high hopes for a figure release, I felt that Hasbro would not be the one to make the first figure of Discord. After all, what normal little girl wants a figure that’s a mythological mish-mash (and has no flowing hair to comb)? I figured Funko would be the ones to deliver him to us (even mentioned my hope in my last Funko/MLP review! )…and they have, in a sculpt that I’m sure will cause many of these figures to appear in numerous collections out there! The figure is set in a standard ‘devious’ pose, but it works so well, as it seems Discord is almost always up to something. The sculpting and painting on the figure are simple enough that the detail stays true to the character. Naturally, the antler on Discord’s head is dulled down to avoid unwanted impalings (and lawsuits). However, there are a few vinyl abnormalities here and there. There is a strange vinyl “wart” on the underside of his lion’s paw. I checked through 3-4 different figures, and they all seemed to have this. As well, the texture on his right leg goes from smooth to slightly rough. It also looks like his left clawed hand should fit snugly into some grooves inside of the lion’s paw. This may have been some molding error that didn’t line up properly with the final product here. There are a few other areas that have some vinyl abnormalities, but unlike most on Rarity, they aren’t in many noticeable places. Since the earliest release pictures for this figure, many have been wondering just how tall Discord is compared to the other pony figures. While the regular pony figures measure 5 1/2 inches tall on average, Discord clocks in at 8 1/2 inches. This puts him 2 inches taller than the previous record-holder, Big McIntosh (who measured 6 1/2 inches high). Size has often been a hard thing to get down regarding Discord, since he often changes shape and form throughout the series, and is rarely ever in a static position. Some have said his figure’s size is too small for the regular-sized line, but seems to be almost to-scale with the blind box ponies Funko is releasing. This was one figure that I was looking forward to the most upon its announcement, and much like the Applejack figure in my previous review, Discord comes through with flying colors. Even with small abnormalities here and there, the overall product triumphs over the Rarity release in so many ways. 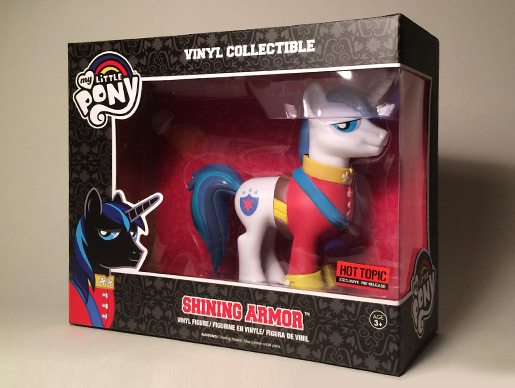 The new pony releases to Hot Topic go for $18.50, with Discord running a little more, at $24.50. If you’re trying to watch your budget, keep in mind that Hot Topic usually has little sales here and there. I was incredibly lucky when I walked into the nearest one, and they were having a “Buy 1 item, get a 2nd item for 50% off” sale, helping remove the sting of a super-pricey afternoon purchase! Like previous releases, Funko has released clear-plastic variants of Rarity, Daring Do, and Discord. Keep in mind that these are exclusive variants, and are packaged at a ratio of 1 to every 24 of a figure. Some of the characters like Princess Celestia and Queen Chrysalis have been made by Hasbro, but I’m sure many would like to see what Funko could do with these figures using their methods. Given packaging sizes, I could see a 4-pack of Applebloom, Sweetie Belle, Scootaloo, and Spike. It’s been a given that usually after a new release, someone on the internet manages to leak prototype pictures of Funko’s next releases. So very soon, we should know what will be coming out in the next few months from one of my favorite toy and collectible makers. Keep em’ coming, guys!